Ford will unveil the 2016 Ford Police Interceptor Utility vehicle at the Chicago Auto Show this Thursday, kicking off a new chapter for the utility that has changed the face of law enforcement. To create the most innovative law enforcement vehicles, Ford listened to the experts. The Police Advisory Board was created by Ford to refine and develop future products that meet the needs of law enforcement agencies. The board, created in 2000, consists of a rotating panel of 25 experts from the law enforcement community. The group has supplied Ford with customer feedback and served as a pilot group for products, programs and services. The 2016 Ford Police Interceptor Utility features a new front and rear design, new headlamps, a new instrument panel and an enhanced electrical system to distribute electrical loads more efficiently. Available Surveillance Mode technology warns the driver when someone approaches the rear of the vehicle. Upon detection, the driver’s window automatically raises and all doors lock. Ford is the first manufacturer to bring this innovative feature to market. As a direct response to customer feedback, Ford added a liftgate release switch, accessible to occupants in the front. It allows the rear liftgate mechanism to remain unlocked for 45 seconds before timing out, permitting officers to access the cargo area. A rear camera with washer is standard for the 2016 model with a 4-inch screen in the center stack. As an option, the view from the camera can be seen in the rearview mirror. 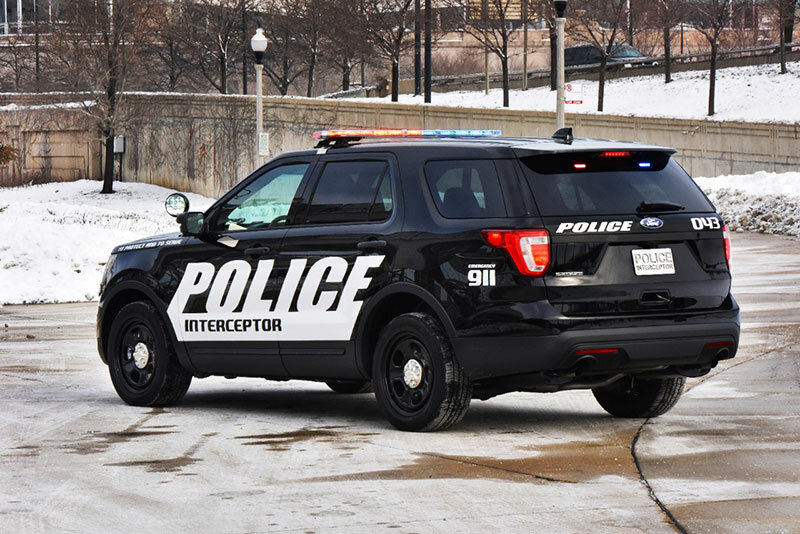 Ford Police Interceptor Utility comes standard with a 3.7-liter V6 producing 304 horsepower and 279 lb.-ft. of torque, while an available 3.5-liter EcoBoost® V6 makes 365 horsepower and 350 lb.-ft. of torque, allowing agencies to select the engine that best meets their patrol requirements. Police Interceptor Utility’s standard all-wheel drive is designed to deliver low-speed traction and high-speed handling and stability. Both engines have been calibrated to meet extreme test requirements defined by the Michigan State Police and Los Angeles County Sheriff’s Department. Tests include aggressive driving on road courses and racetracks, braking and acceleration, top speed and city pursuit testing. In both Police Interceptor models, the standard six-speed transmission features a unique Pursuit Mode specifically programmed for law enforcement use. The transmission automatically switches from normal, fuel-saving operation to Pursuit Mode when it detects aggressive driving situations, based on brake line pressure, deceleration and lateral acceleration rates. Once in Pursuit Mode, the upshift and downshift performance of the transmission is optimized for aggressive driving, returning to fuel-save mode when it senses the aggressive driving is complete. The software is tuned to perform a reverse J-turn, which is when a reversing vehicle is spun 180 degrees and continues, face forward, without changing direction of travel. In addition to unique cooling systems designed for extreme use, Police Interceptor also features custom-developed brakes designed to withstand excessive use. The 18-inch steel wheels have high venting characteristics to help cool the brakes. The unibody structure of Police Interceptor Utility features boron steel in the A-pillar and a hydroformed, high-strength steel tube that runs the width of the vehicle to improve structural rigidity. Interior and exterior dimensions remain the same for the 2016 model. 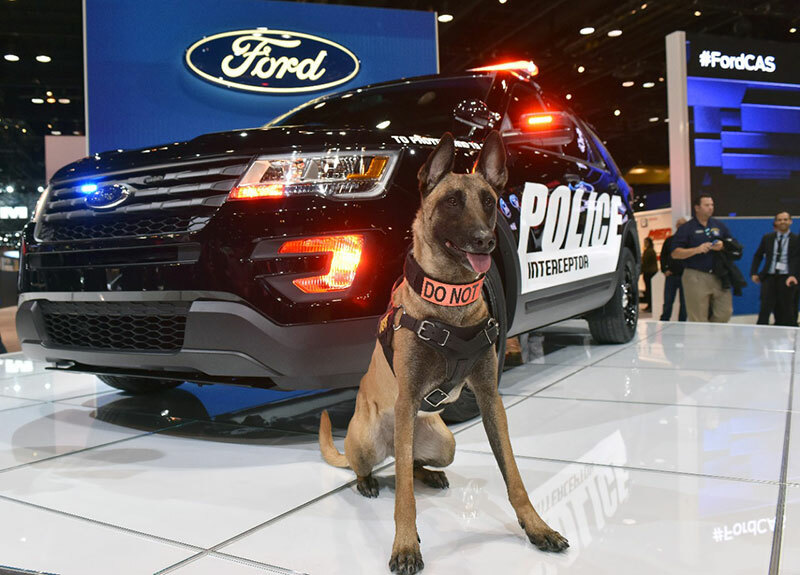 Police Interceptor Utility and Police Interceptor Sedan are sold in more than 80 markets around the world, but built in the heartland of America, at Ford’s Chicago Assembly Plant. Once initial work is completed at Chicago Assembly Plant, the vehicles are transported less than a mile away to Troy Design and Manufacturing to be upfitted with law enforcement equipment. One of the most important and recognizable features of Police Interceptor are the lights. The 2016 Police Interceptor Utility allows agencies to choose from up to 25 different patterns. The lights are now better integrated into the new front and rear fascia, allowing for a more seamless design and a stealthier look for patrol duty. In a nod to police vehicle nostalgia, Ford added a blinking white function called “wig-wag” to the incandescent high-beam light bulbs.